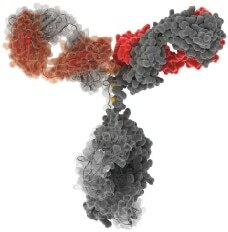 Immunoglobulin, also known as antibody, which produced by plasma cells , is a large Y-shape protein. There are five isotypes in placental mammals, which are IgA, IgD, IgE, IgG, and IgM. The immune system, which is highly complex and exceedingly specific, uses these glycoprotein molecules to identify and neutralize particular antigens, such as bacteria and viruses. Immunoglobulin acts as a critical part of the immune response by specifically recognizing and binding to foreign objects, such as bacteria or viruses and aiding in their destruction. The various immunoglobulin isotypes differ in their biological features, structures, target specificity and distribution. Hence the assessment of the immunoglobulin isotype can provide useful insight into complex humoral immune response.